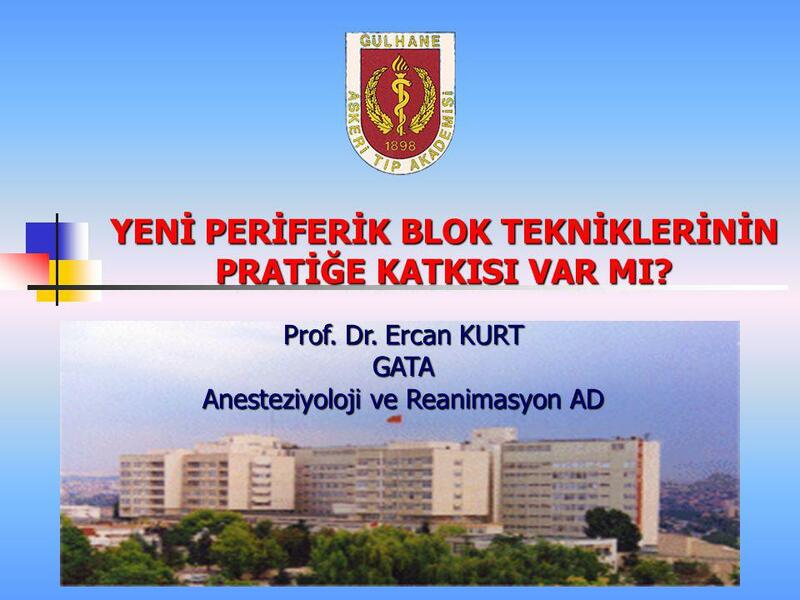 YENİ PERİFERİK BLOK TEKNİKLERİNİN PRATİĞE KATKISI VAR MI? 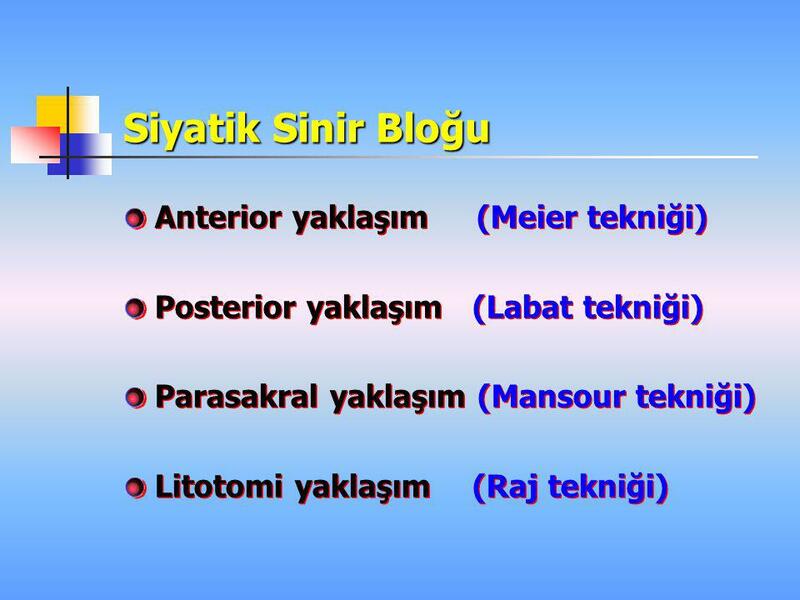 1 YENİ PERİFERİK BLOK TEKNİKLERİNİN PRATİĞE KATKISI VAR MI? 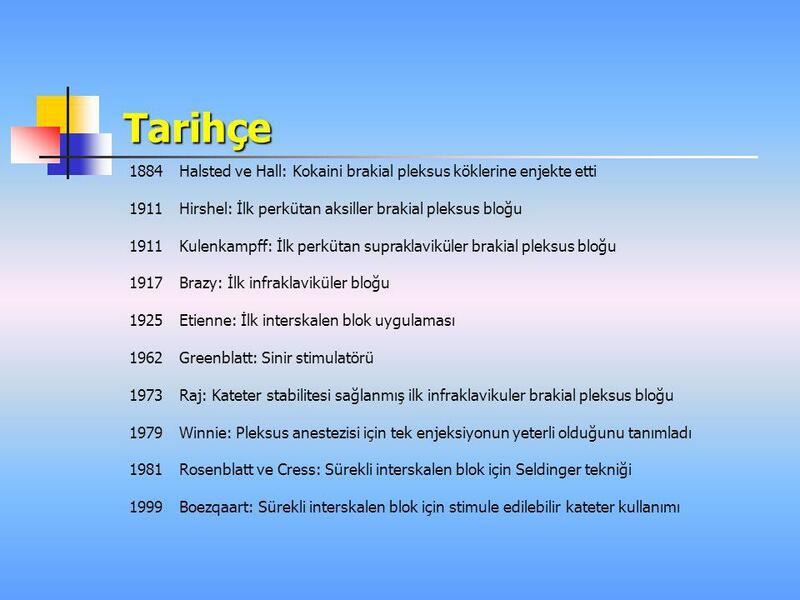 6 Periferik Sinir Bloklarında Yeni Tekniklere İhtiyaç Var Mıdır ? 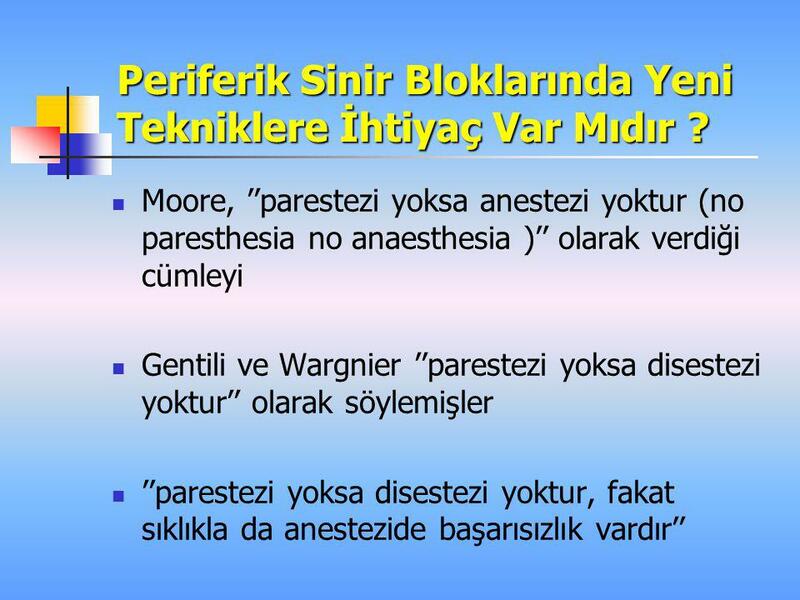 Moore, ’’parestezi yoksa anestezi yoktur (no paresthesia no anaesthesia )’’ olarak verdiği cümleyi Gentili ve Wargnier ’’parestezi yoksa disestezi yoktur’’ olarak söylemişler ’’parestezi yoksa disestezi yoktur, fakat sıklıkla da anestezide başarısızlık vardır’’ Moore DC, Mulroy MF, Thompson GE. 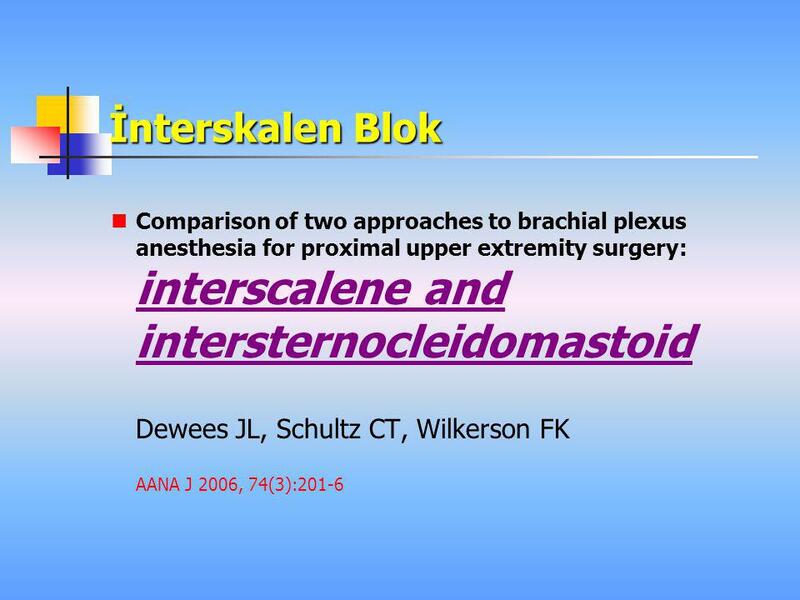 Peripheral nerve damage and regional anaesthesia. [Editorial]. 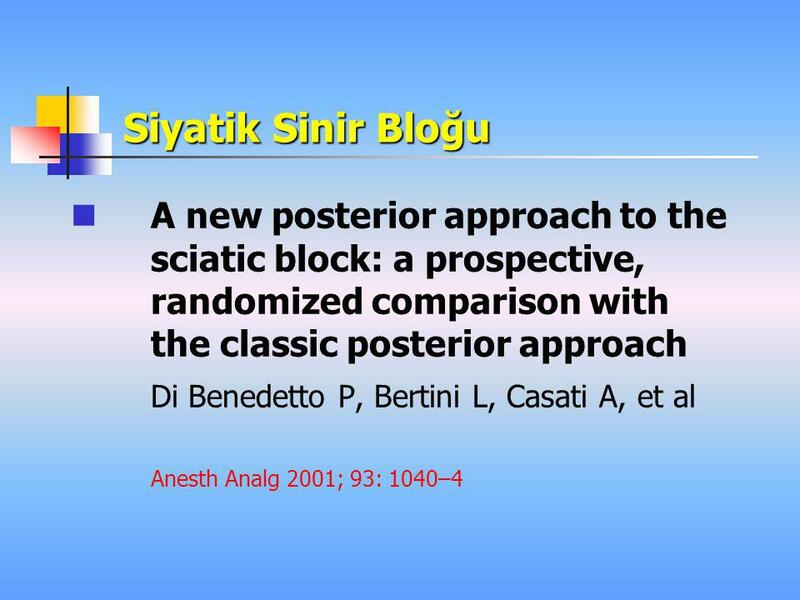 Br J Anaesth 1994; 73: 435–6. 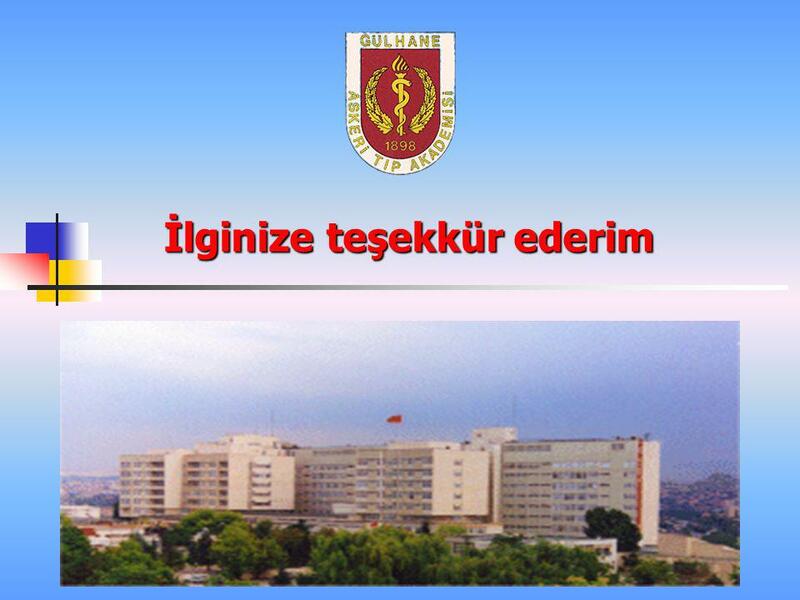 8 Periferik Sinir Bloklarında Yeni Tekniklere İhtiyaç Var Mıdır ? 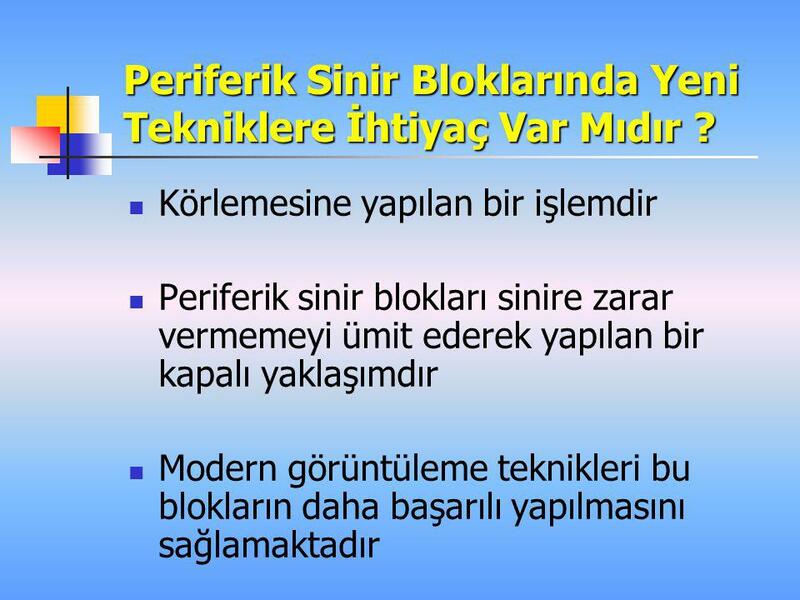 9 Periferik Sinir Bloklarında Yeni Tekniklere İhtiyaç Var Mıdır ? 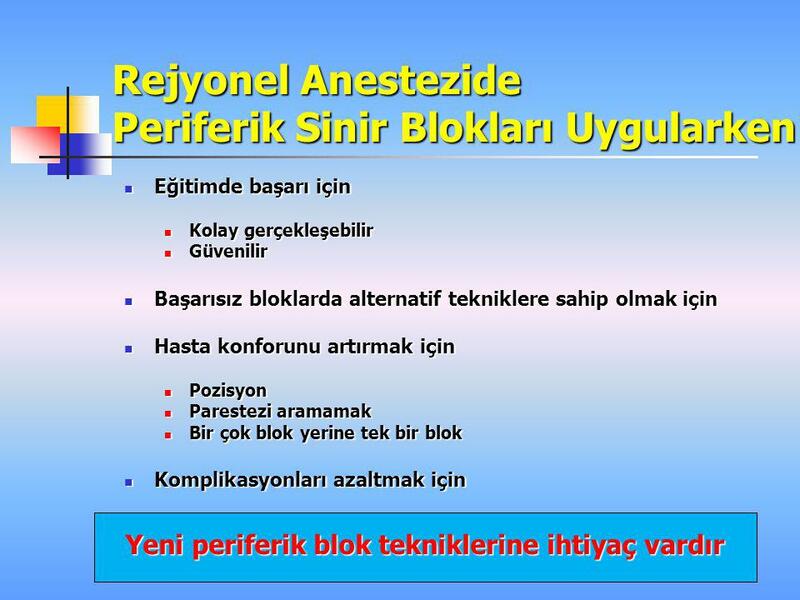 10 Periferik Sinir Bloklarında Yeni Tekniklere İhtiyaç Var Mıdır ? 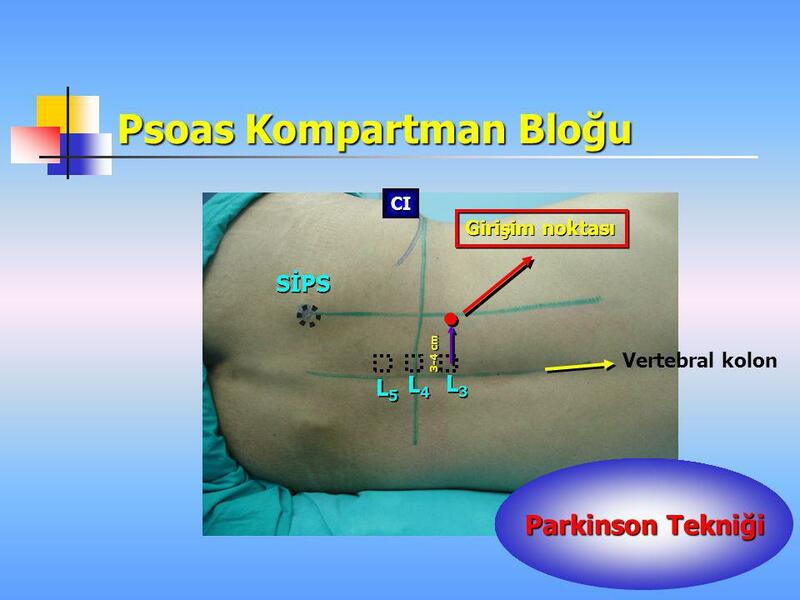 Principles of PEG The PEG concept acts to optimize the above variables in such a way as to make transcutaneous stimulation and therefore pre-location of the target-nerve or nerves possible at relatively low amperage (< 5 mAmp). 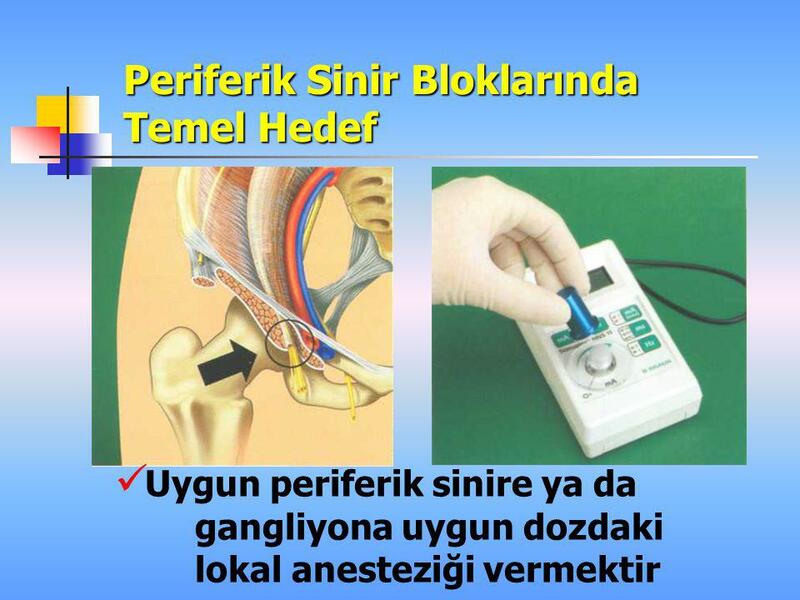 The use of a smooth-tipped electrode allows indentation of the skin without significant discomfort. 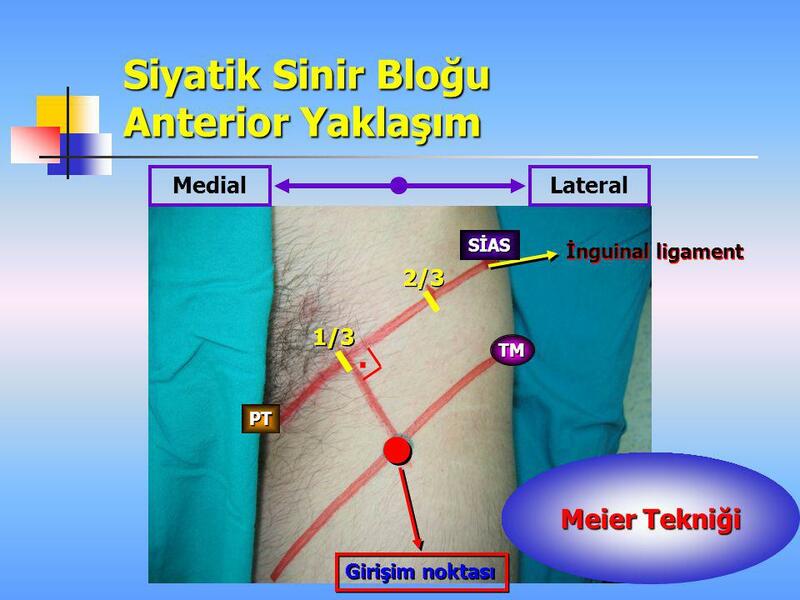 Indentation of the skin acts to minimize distance to the nerve and to decrease electrical impedance by compressing the underlying tissues, which increases electrical conductance. 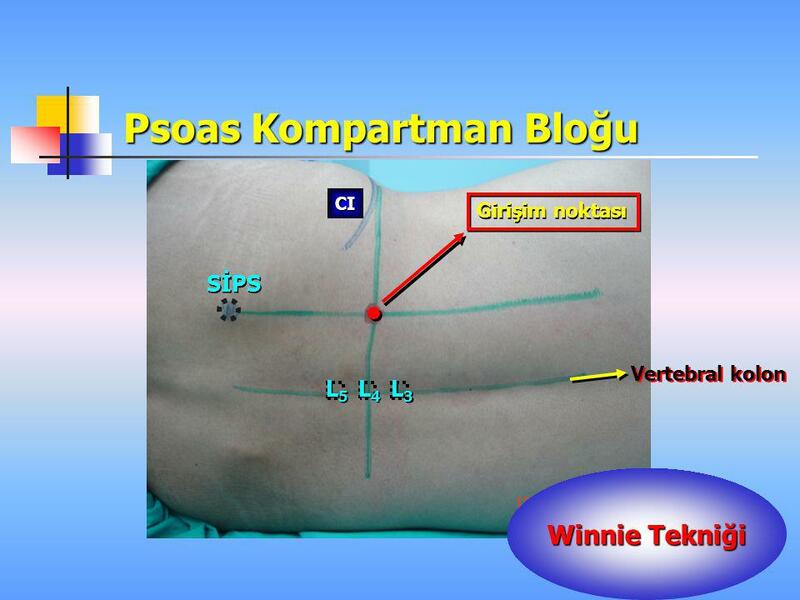 By contrast to traditional needle tip location, where a very short pulse duration is desirable for precise location with the needle-tip, cutaneous stimulation benefits from longer pulse durations ( msec). 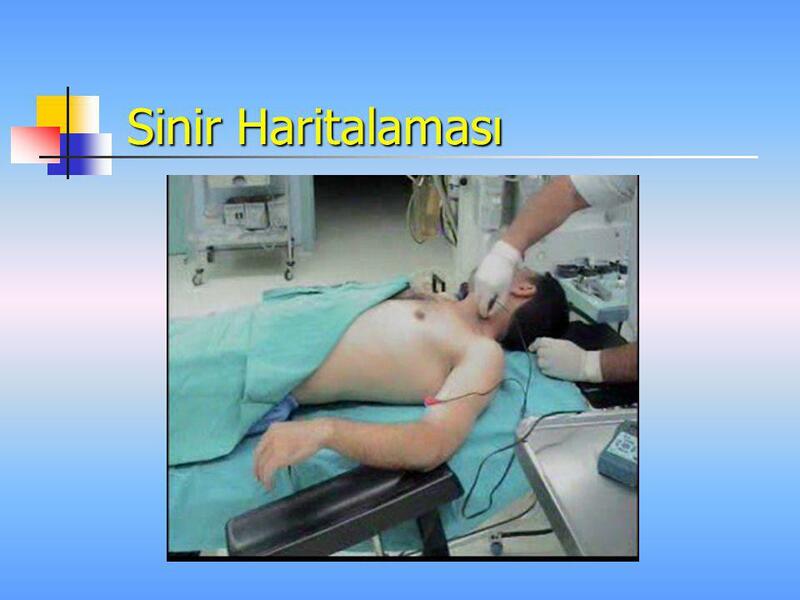 Higher pulse duration allows for motor response at lower amperage. 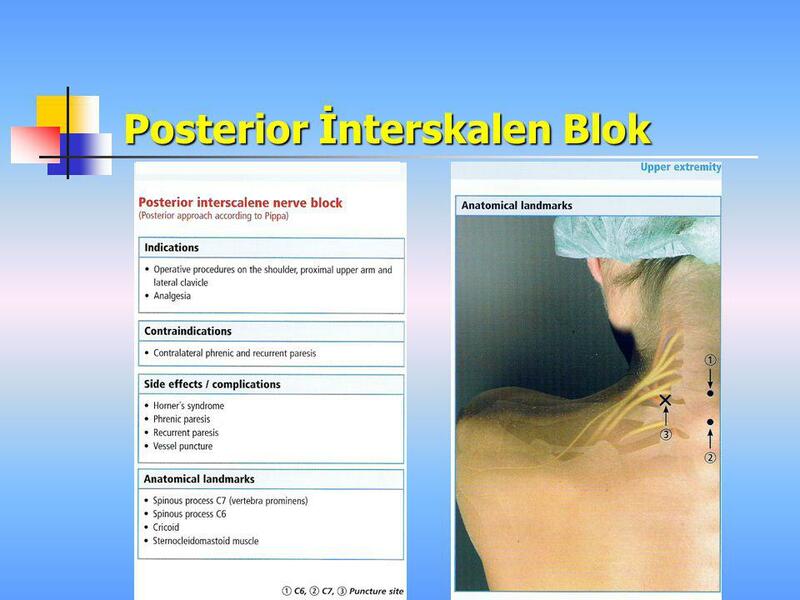 Indentation of the skin (in some cases several centimeters is necessary) brings the cutaneous electrode into fairly close proximity of the nerve or neural plexus. 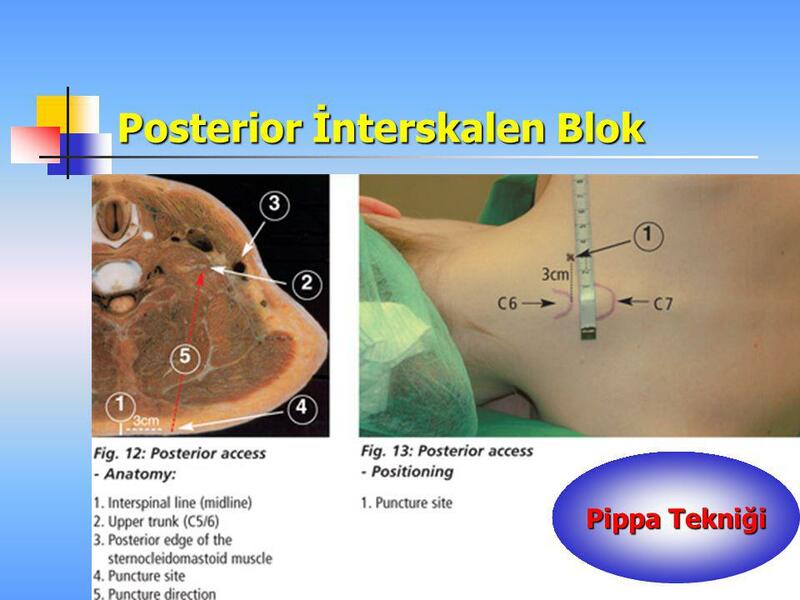 Since much of the locating is done by the probe, which indents the skin toward the nerve, the needle tip typically travels only a short distance to the nerve. 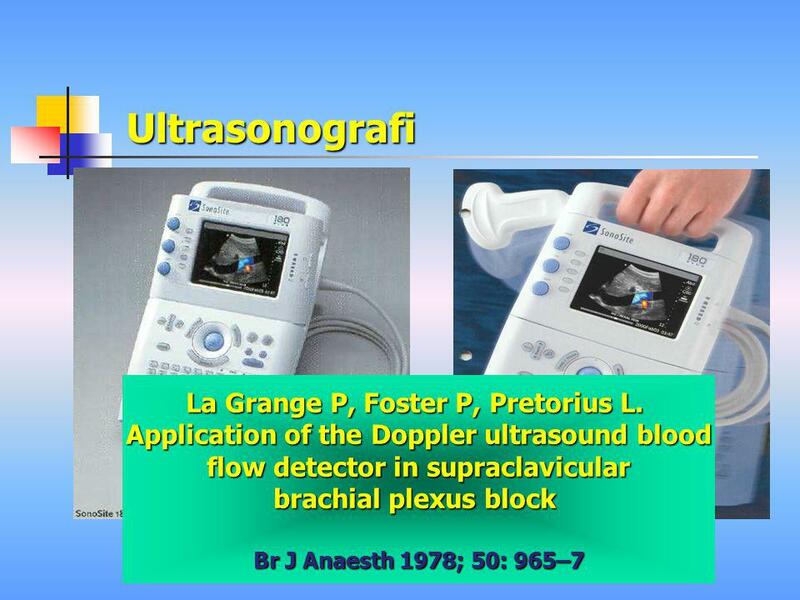 Initial Clinical Experience with the PEG Technique Urmey and Grossi4 reported the first clinical cases of peripheral or plexus blocks utilizing the PEG technique. 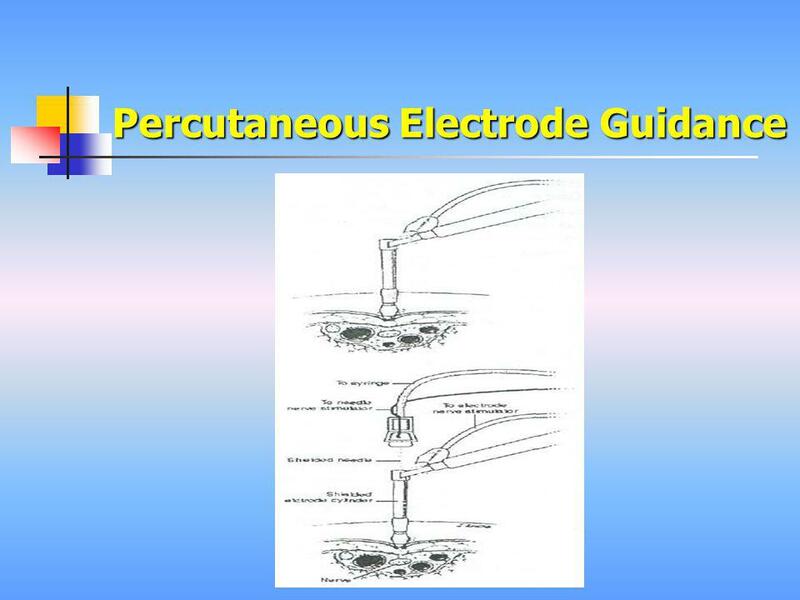 The authors used a cylindrical cutaneous electrode with a 1 mm diameter metallic conductive tip. 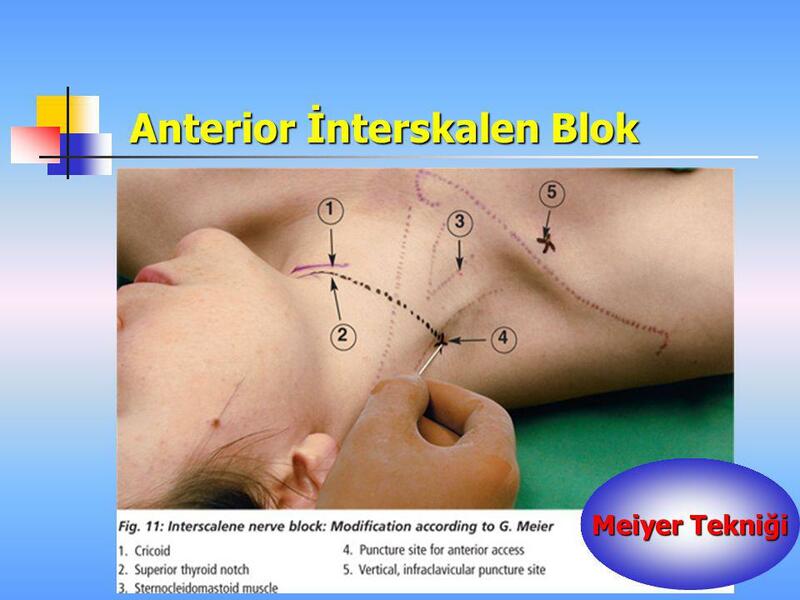 After positioning the probe and indenting the skin over the target nerve, specific motor responses were sought. 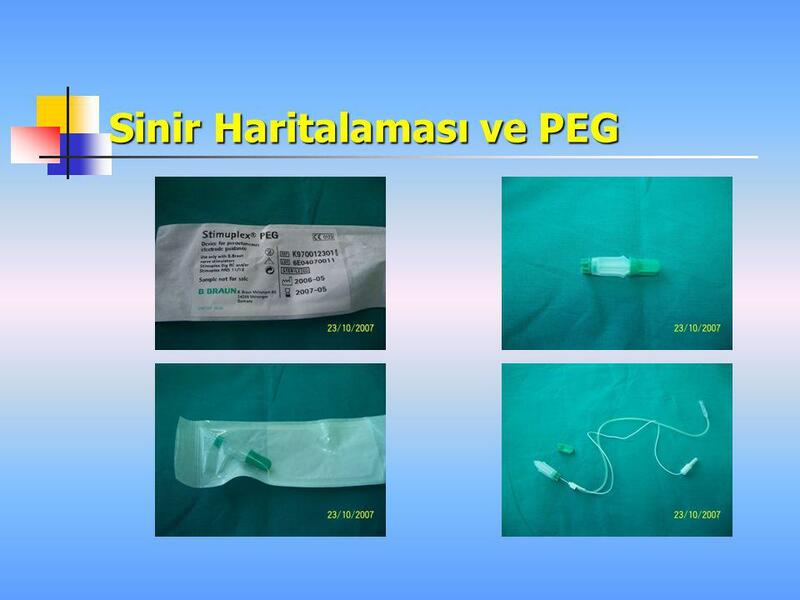 At the point of maximal motor response at minimal cutaneous probe amperage (2 Hz, 0.2 msec) the cutaneous stimulator was turned off and a standard commercial nerve stimulator needle was passed through the probe to the nerve. 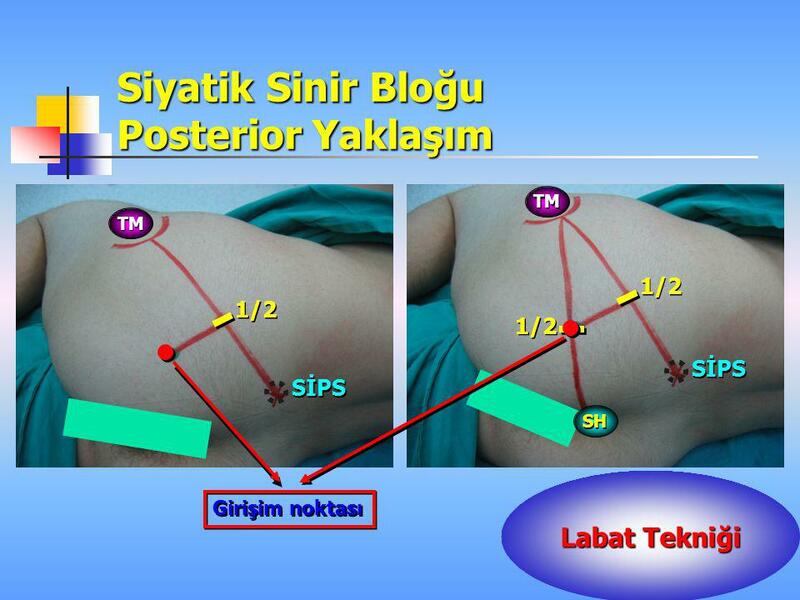 This method was used in 7 patients. 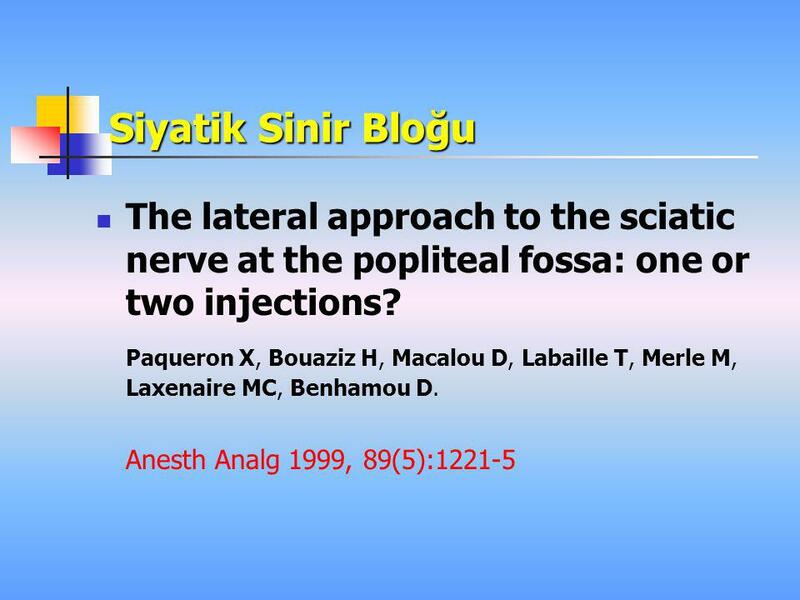 Since the nerves were pre-located with the cutaneous electrode, the needle was introduced in each case with beginning amperage of 0.5 mAmp (normally acceptable as an endpoint). 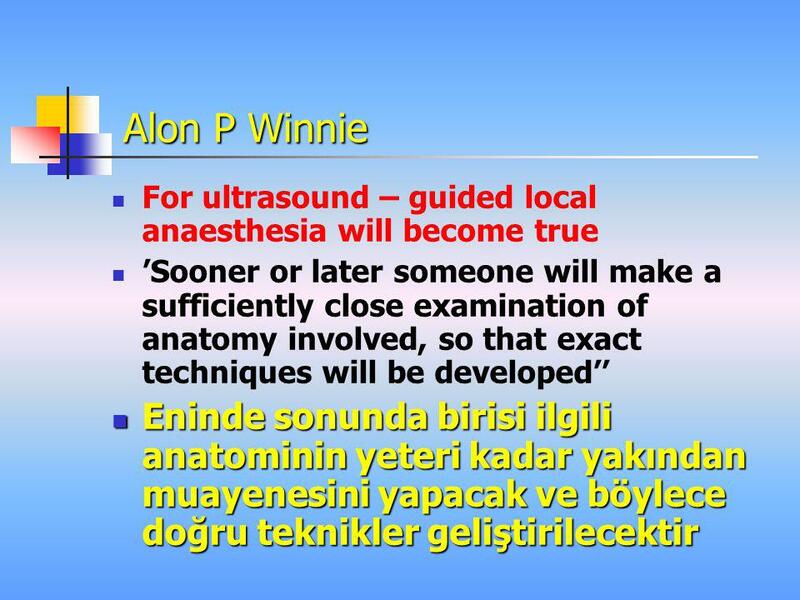 In only one case was it necessary to increase the needle amperage above 0.5 mAmp. 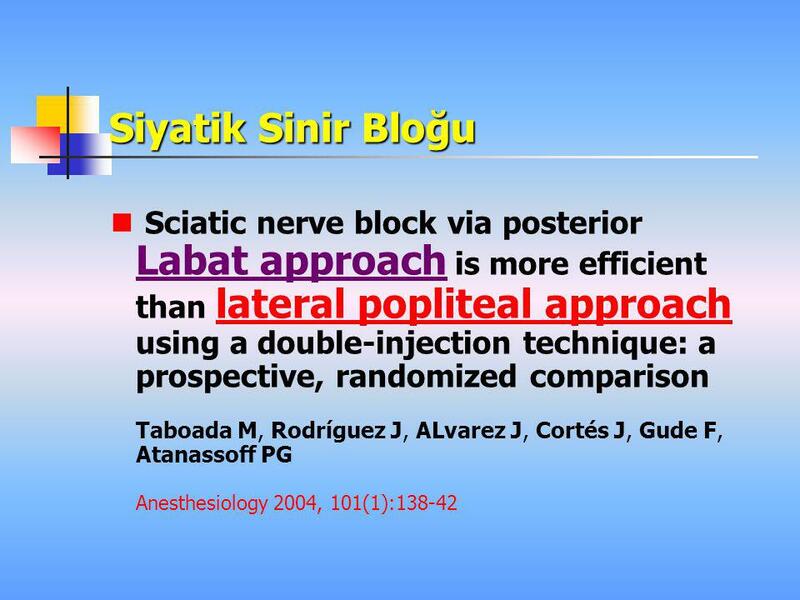 Targeted nerves were found easily within seconds of the start of indentation and exploration of the skin with the cutaneous electrode. 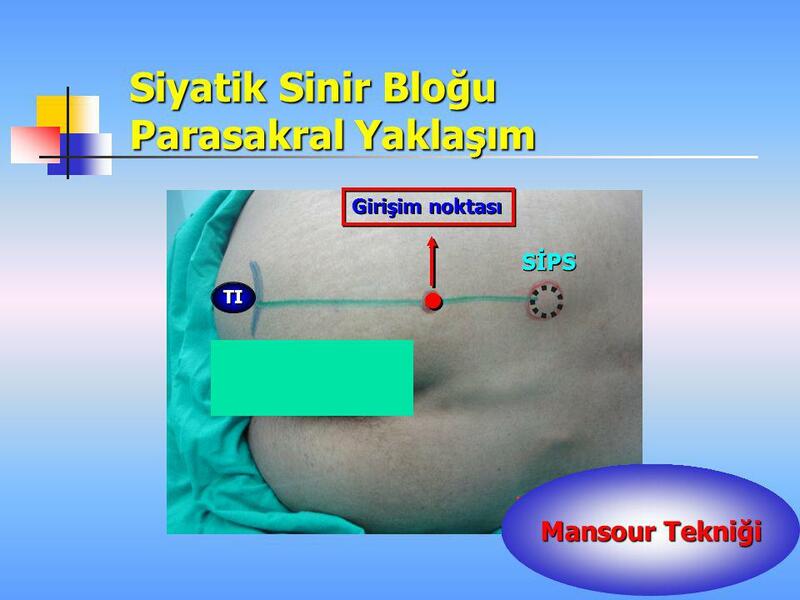 Minimal transcutaneous stimulation current in mAmp correlated directly with the measured needle depth (beyond the probe tip). 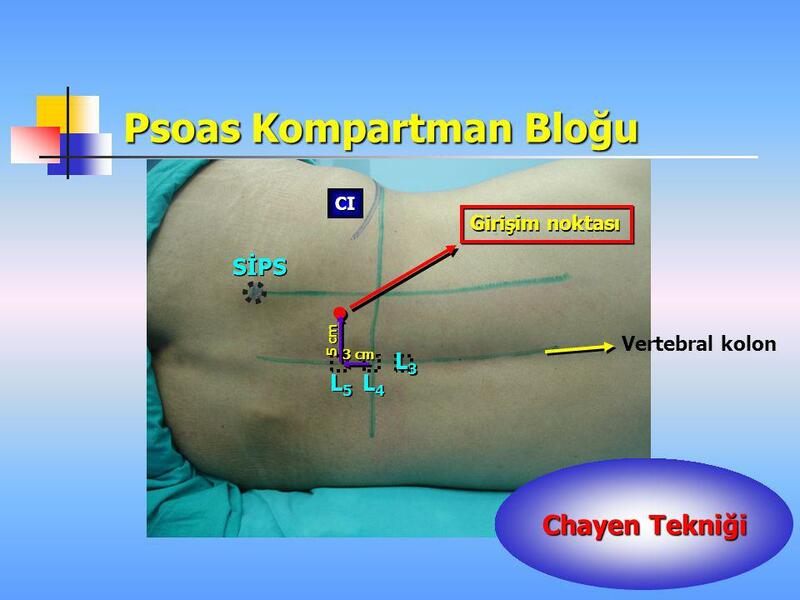 Maximal needle protrusion depth in these initial patients was 2 cm. 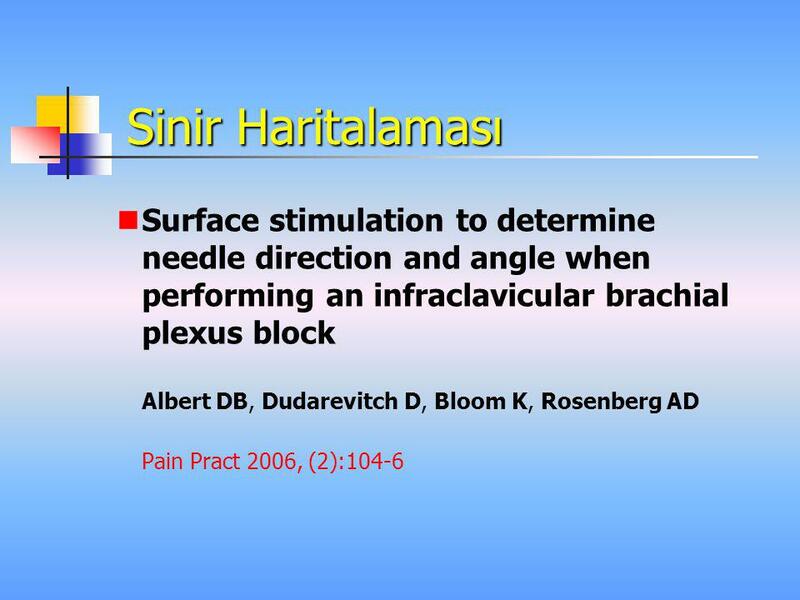 Thus the technique is more useful for blocking superficial nerves or plexuses. 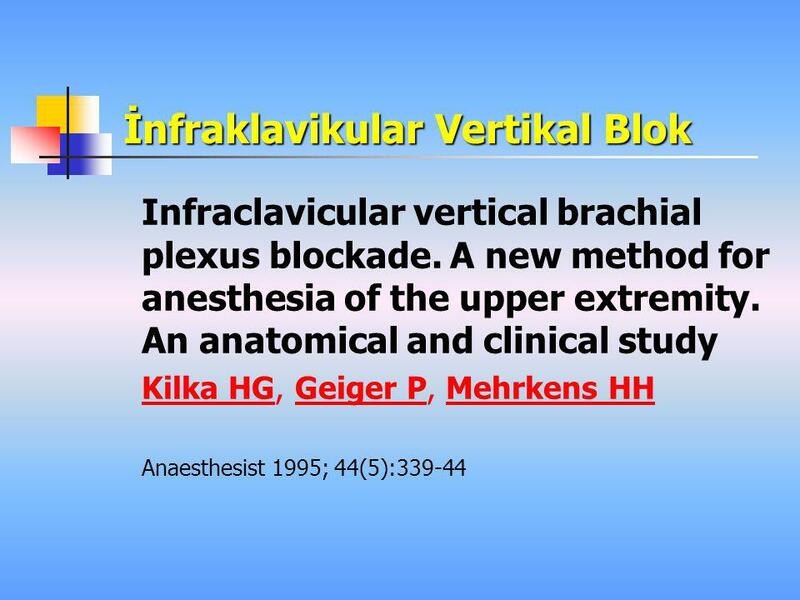 These include 1) brachial plexus block, 2) midhumeral block, 3) wrist block, 4) femoral nerve block, 5) popliteal fossa block and, 6) posterior tibial nerve block. 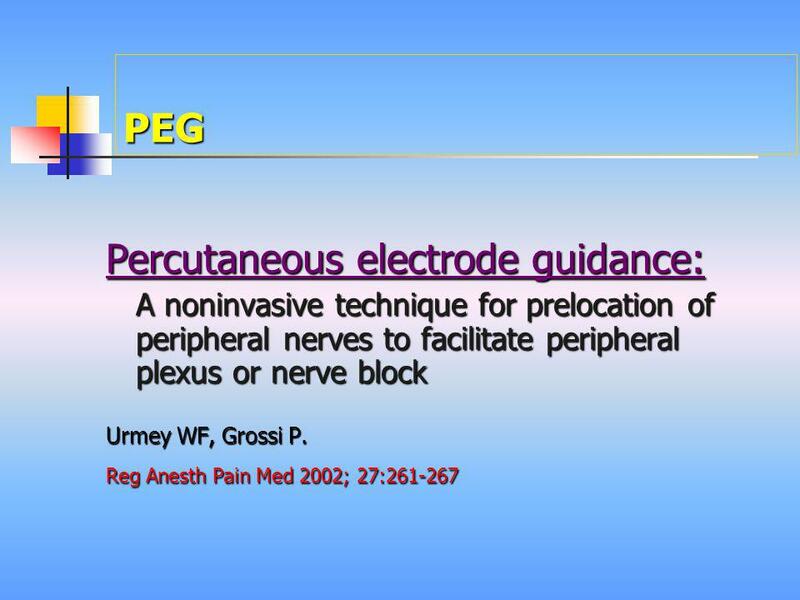 PEG is in its infancy and has tremendous potential to make peripheral nerve blocks less intimidating to the beginning practitioner. 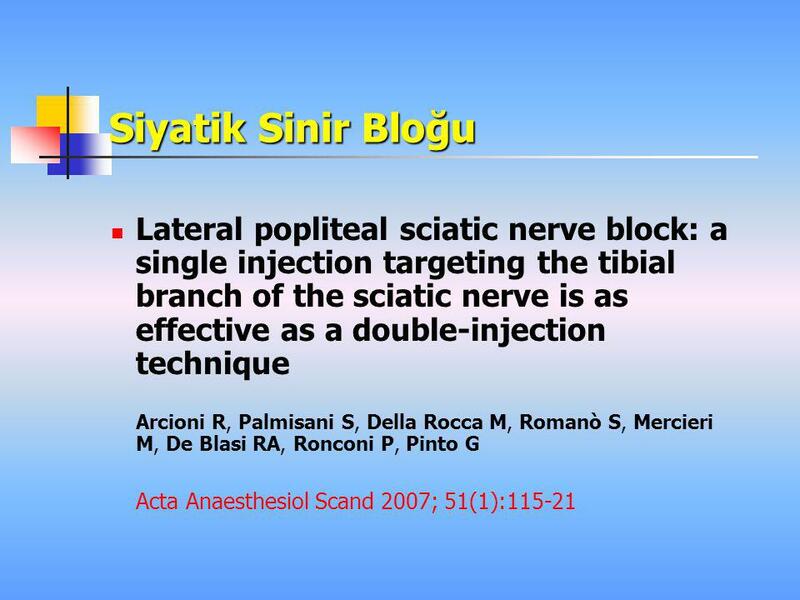 PEG may decrease time for block performance and increase safety of peripheral nerve blockade by decreasing the number of invasive needle passes. 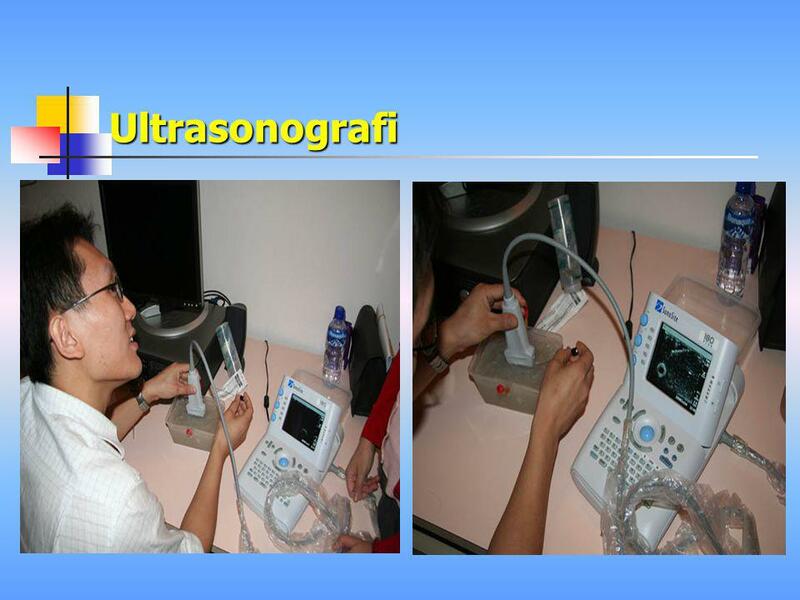 The probe has been successfully used to teach in workshop settings. Further clinical studies are certainly indicated. 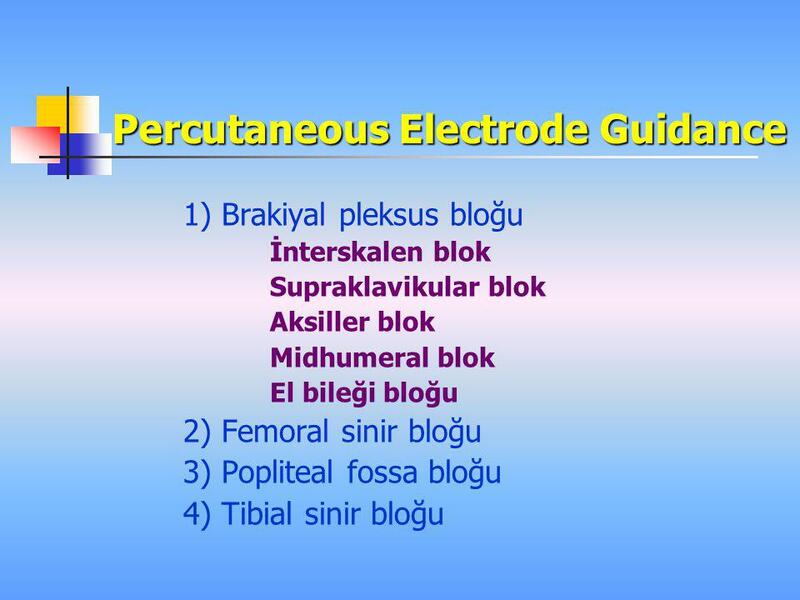 Sequential Electrical Nerve Stimuli (SENS) to Locate Nerves On presently manufactured nerve stimulators, current amplitude (amperage) is able to be continuously varied in an analog manner, for example by potentiometer, at constant frequency and constant pulse duration (time-based width of the square wave). 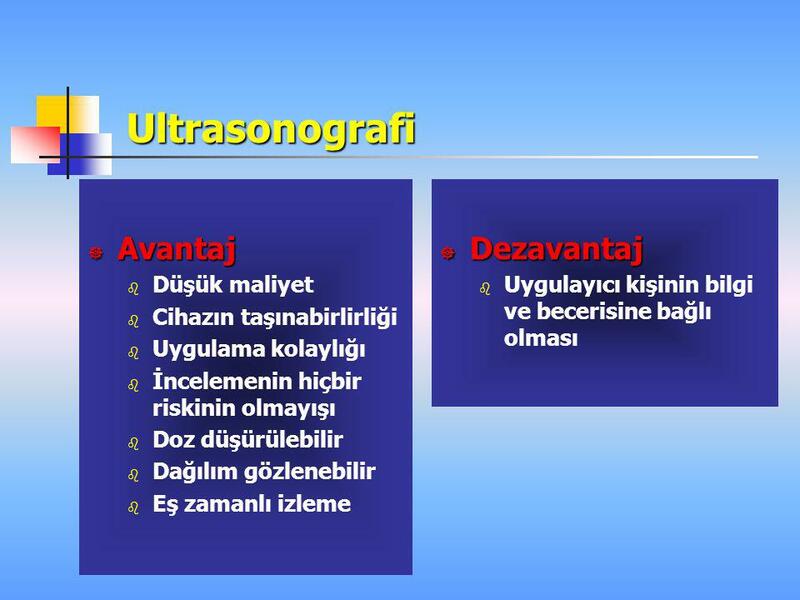 Although nerve stimulators have been produced and used that have the capability of changing pulse duration, to date, only one fixed pulse duration has been used at any given time. 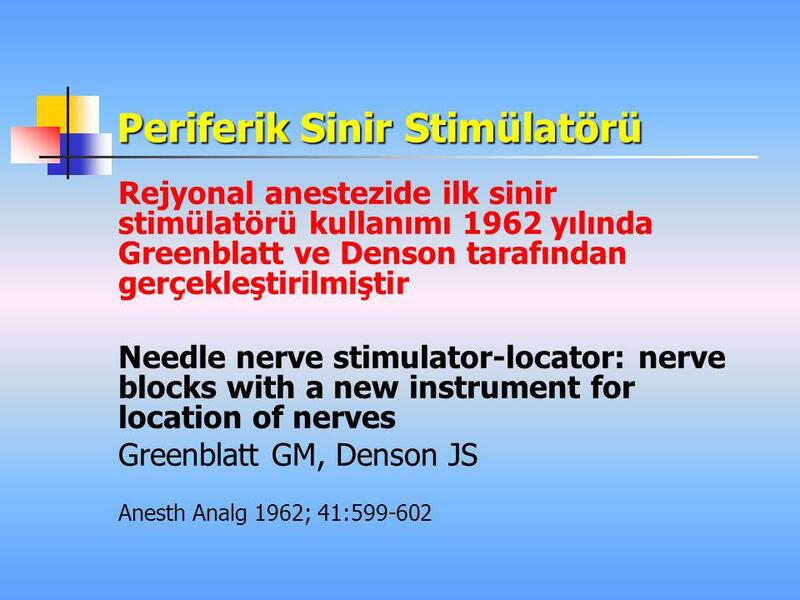 Most commercial nerve stimulators have been manufactured to stimulate with a single fixed pulse duration (e.g. 0.1 or 0.2 ms). 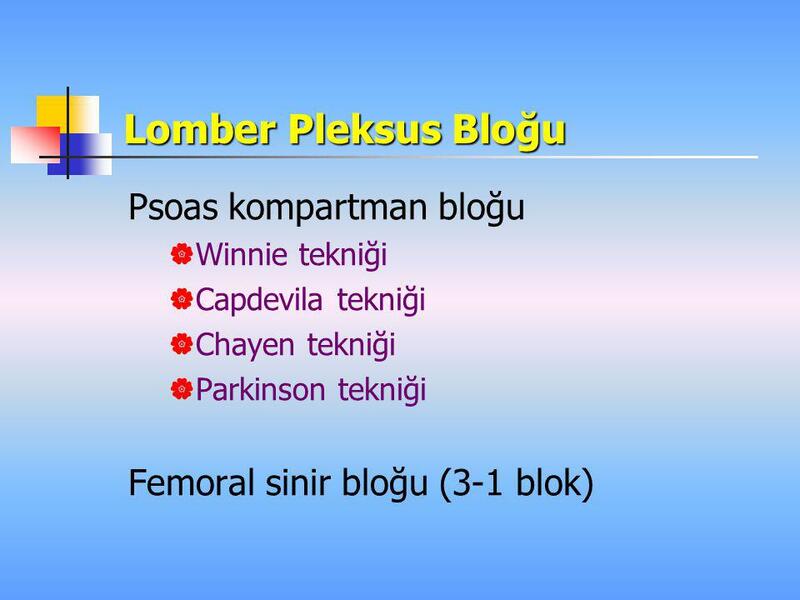 Some newer nerve stimulators allow pulse duration to be set at different fixed pulse widths (e.g. 0.05, 0.1, 0.3, 0.5, or 1.0 ms) by the push of a button, while current amplitude is varied in an analog manner. 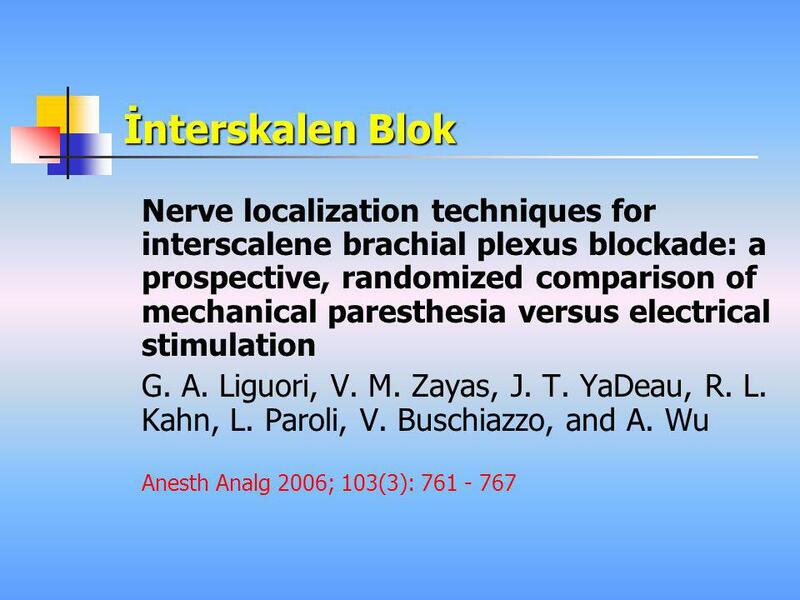 Although successful stimulation of the nerve with small pulse durations favors optimal final positioning of the needle electrode near the nerve, in practice motor responses often disappear with only minor changes in needle position during the search for the nerve. 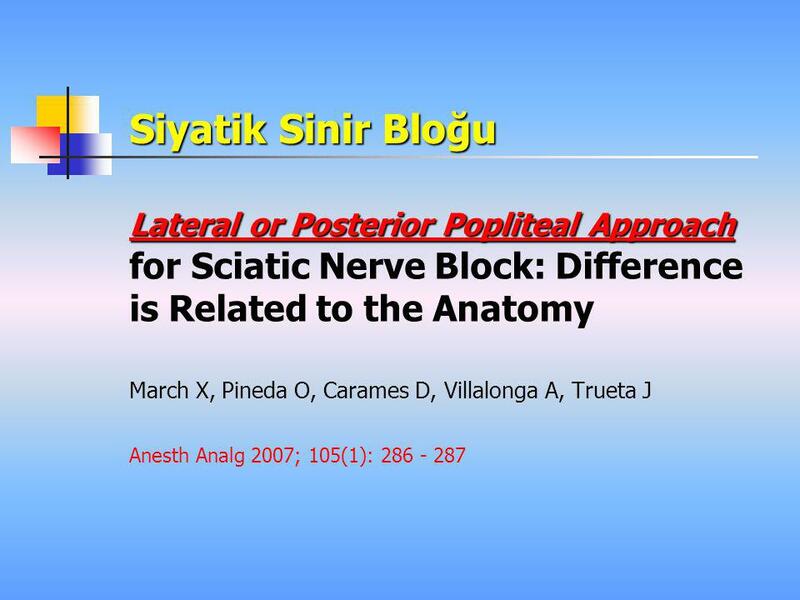 Thus, with conventional nerve location, sensitivity has been sacrificed in the interest of enhancing specificity. Urmey and Grossi12 recently evaluated a novel technique for nerve location utilizing an electrical nerve stimulator programmed to deliver sequenced electrical nerve stimuli (SENS). 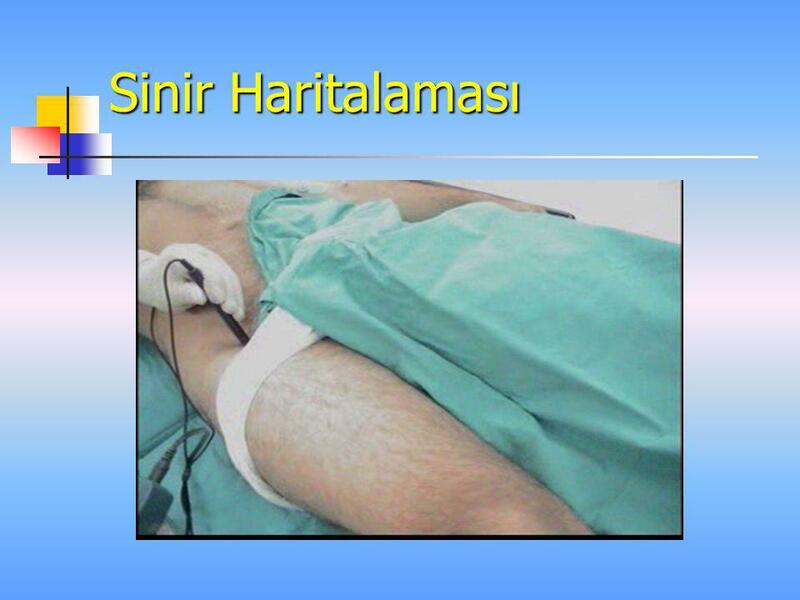 The nerve stimulator generated alternating sequential electrical pulses of differing pulse durations at an overall set frequency of 3 Hz. Repeating pulse duration sequences of 0.1, 0.3, and 1.0 ms were generated with 1/3 second period intervals separating each pulse. 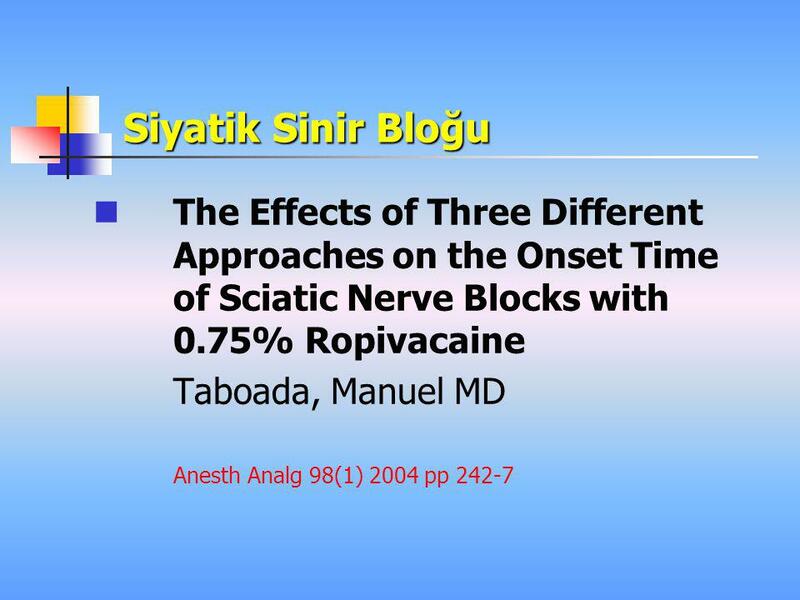 The theory was that specificity of nerve location would be maintained as indicated by 3 motor responses per second at current flow  0.5 mA at final nerve location, since all 3 pulses would be expected to stimulate the nerve at close proximity. 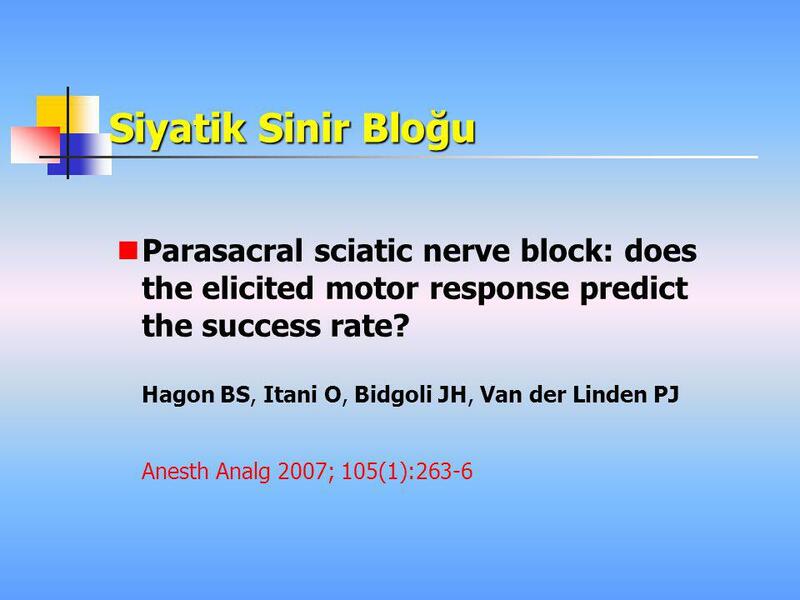 At greater distance from the nerve, only the higher duration pulses would be expected to stimulate the nerve, resulting in only 1 or 2 motor responses per second. 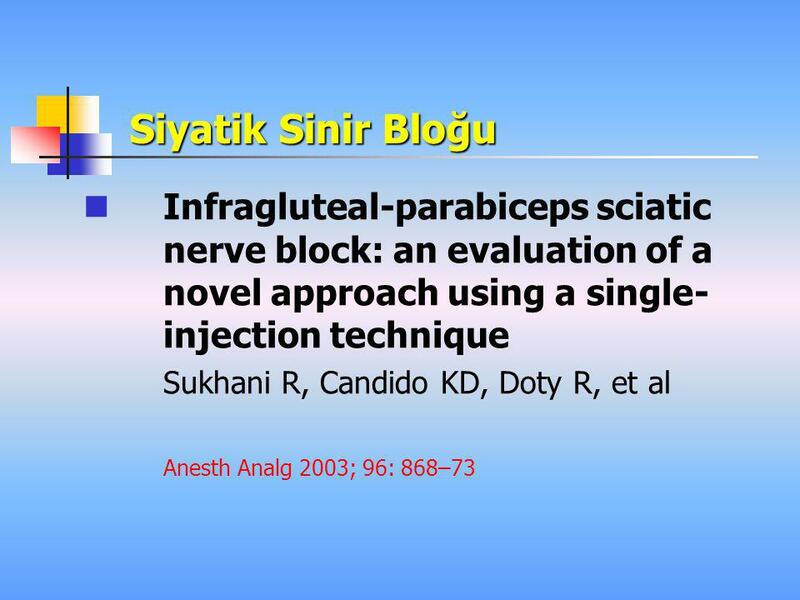 This would serve to increase the range or sensitivity of successful nerve stimulation at distance, without sacrificing specificity for final endpoint. 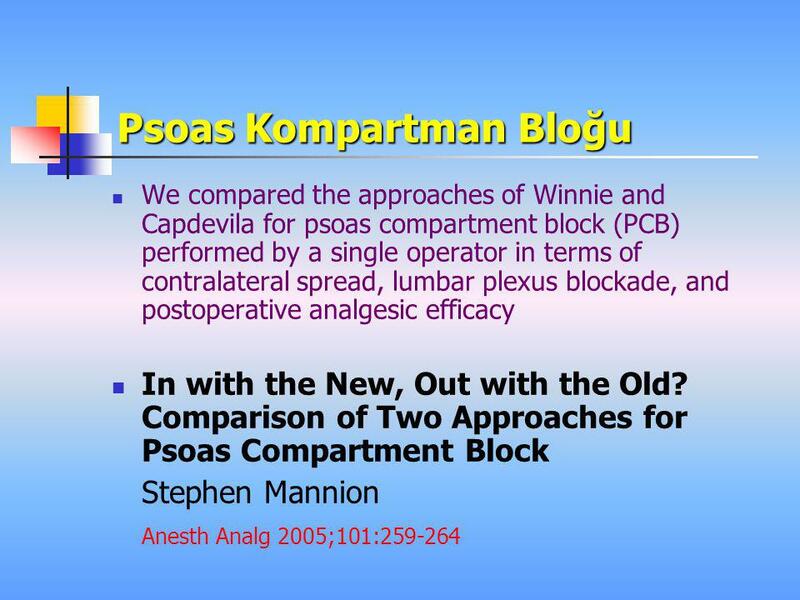 Eight patients were studied during combined sciatic/psoas blocks for a total of sixteen separate blocks. 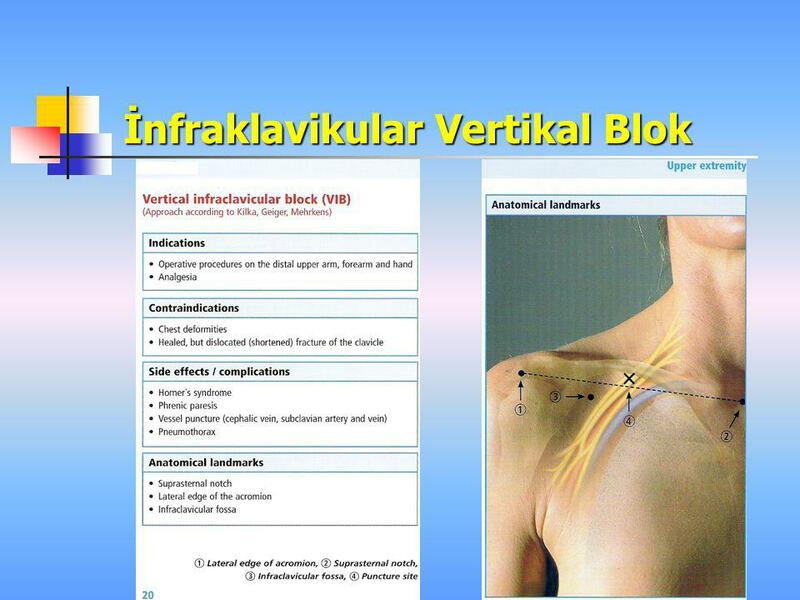 Blocks were performed and analyzed using SENS for nerve or plexus location. Nerve location was performed in a conventional manner, using an 80 mm stimulating needle coupled to a nerve stimulator set an initial amperage of 1.0 mA. 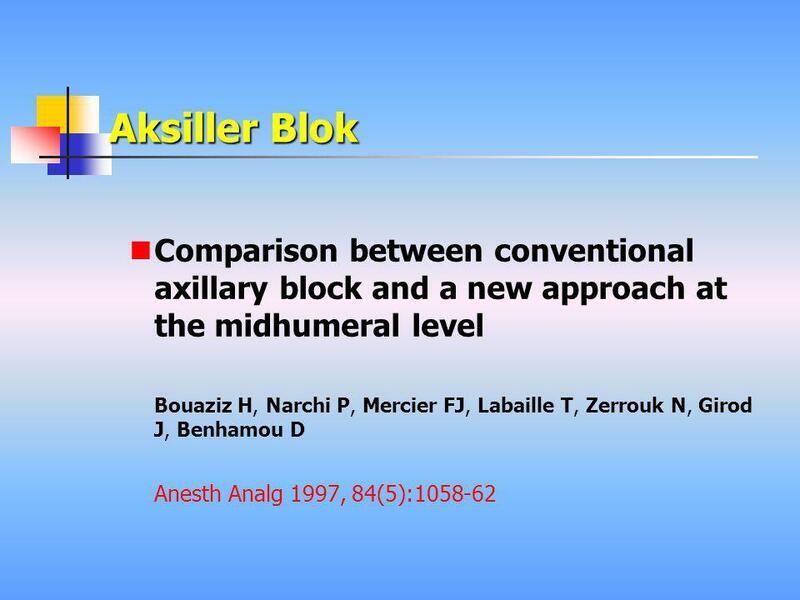 The ground lead was positioned in view, on the calf of the lower extremity to be blocked. 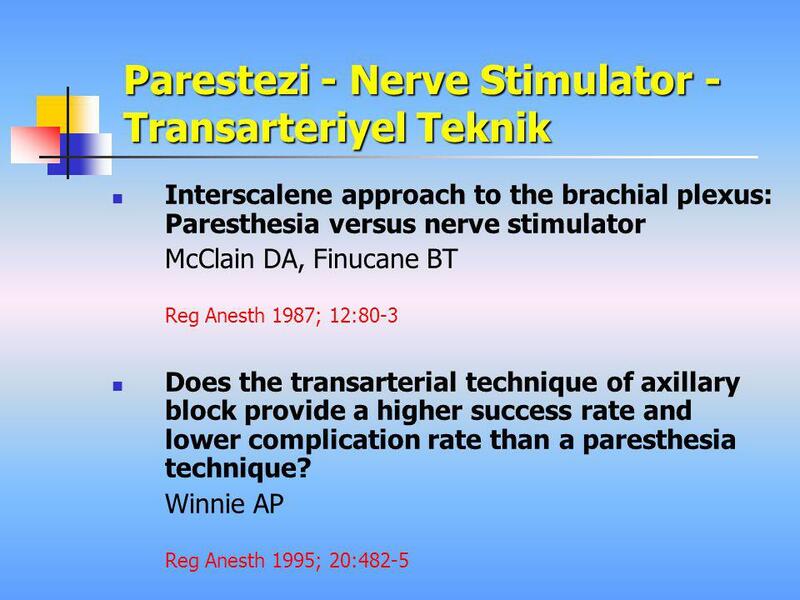 The nerve stimulator had been programmed to deliver repeating sequenced electrical nerve stimuli (SENS) of 0.1, , 0.1, 0.3, 1.0 ms…at 1/3 second intervals between pulses for a maximum stimulating frequency of 3 Hz. 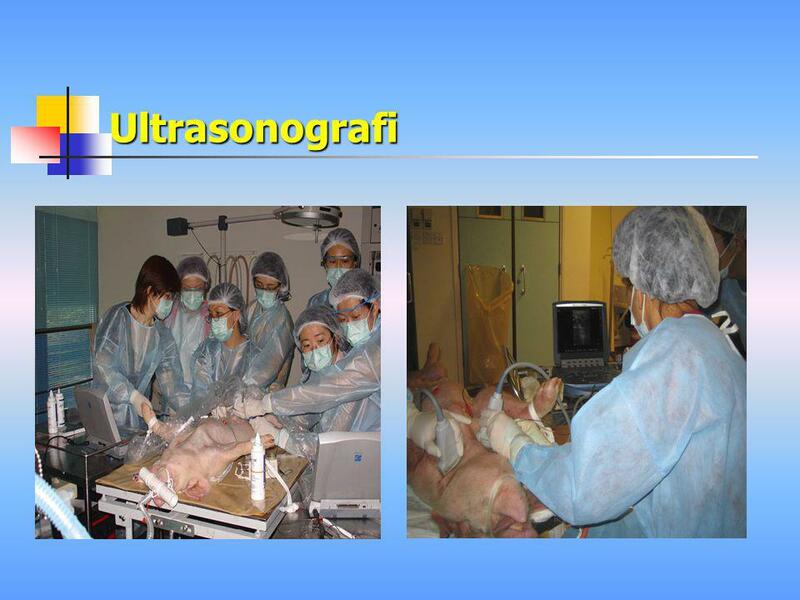 The stimulator had also been programmed to immediately revert to customary single (0.1 ms) pulses at 3 Hz at the discretion of the anesthesiologist at the push of a single button. To avoid motor responses that were too strong, automatic attenuation of the amperage of the 0.3 ms and 1.0 ms pulses was programmed. The current (amperage) for the 0.3 ms and 1.0 ms pulses were attenuated to values equal to 60% and 32% of the value of the 0.1 ms pulse. This selective attenuation of current resulted in the 3 pulses having less disparate (more equivalent) charges. 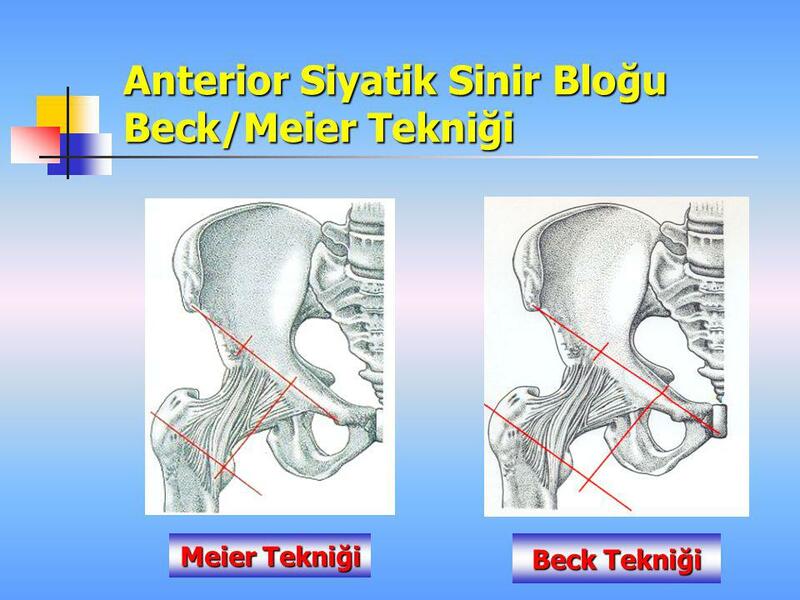 GÜNÜBİRLİK ANESTEZİDE SANTRAL BLOKLAR GÜVENLİ Mİ? 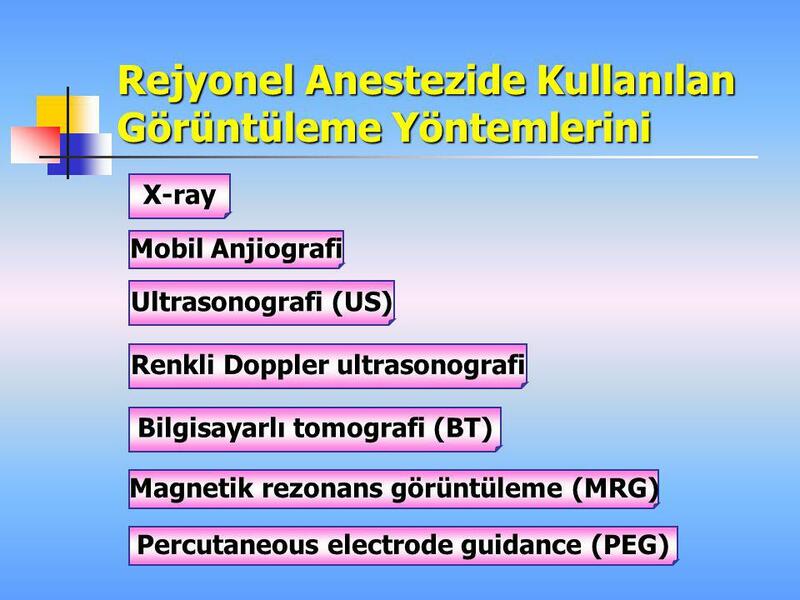 GATF Anesteziyoloji ve Reanimasyon A.D.
MEG A. Kullanılan gereçlerdeki yenilikler B. Uygulamayı kolaylaştıran teknolojik gelişmeler C. Uygulama sonucuna olumlu katkısı bulunan yeni yöntemler.